Molsheim / Basel, March 20, 2019. 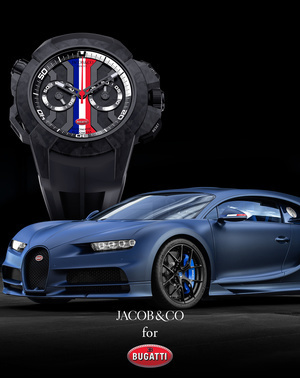 Today, the French hyper sports car manufacturer Bugatti announced a partnership with Jacob & Co., a leader in complicated timepieces and a renowned diamond and jewelry house, to collaborate on a series of exclusive co-branded products. This partnership brings together two companies that share a passion for cutting-edge design, pushing the limits of what seems mechanically possible. 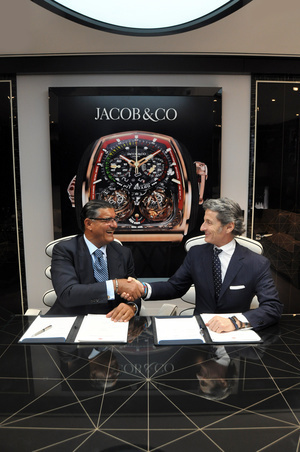 Stephan Winkelmann and Jacob Arabo, the Presidents of Bugatti and Jacob & Co., officialised the partnership at Baselworld 2019. For this project we found the right partner in Jacob & Co., because we are both absolutely dedicated to innovation with superb technology, absolute beauty, craftsmanship and the highest quality of the materialsâ€?? ?, explained Stephan Winkelmann, President of Bugatti, at the stand of Jacob & Co. at Baselworld. When I look at a Bugatti Chiron, the perfectly refined engineering is so powerful that sometimes the car appears to be moving even when it is standing stillâ€?? 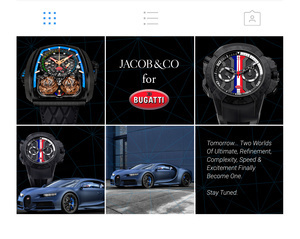 ?, Jacob Arabo, founder of Jacob & Co., added. â€œThatâ€™s the same feeling I get when I wear our high complication timepieces: a rush, a sense of energy, movement and power that can barely be contained.â€??? 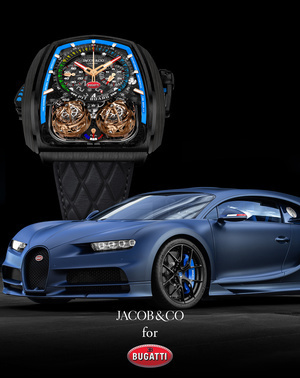 The partnership begins with a limited edition of the Jacob & Co. high complication masterpiece the Twin Turbo Furious Bugatti Edition. 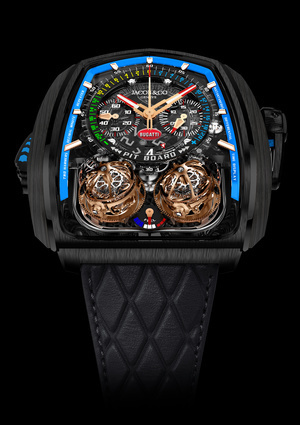 The original Twin Turbo Furious electrified Baselworld when it launched in 2018, with its breathtaking twin triple-axis tourbillons, column-wheel chronograph and decimal repeater. Designed with high performance sports cars in mind, the Twin Turbo Furious Bugatti Edition features turquois around the dial that pays homage to Bugattiâ€™s 110 year anniversary Chiron, positions the Bugatti logo proudly and prominently in the center of the dial and renames the power reserve indicator â€œfuelâ€??? and sports the colors of the French flag on the gauge. Only 39 timepieces will be made, each individually numbered: 18 in carbon fiber, 18 in rose gold, and three with diamonds. 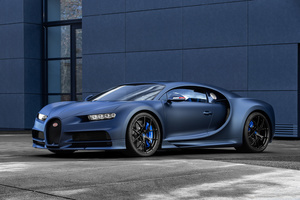 The partnership will also see the release of a special version of a sporty â€œBugatti Chrono Edition LimitÃ©e 110 Ansâ€??? in a limited edition of 110 pieces to mark each year since the founding of Bugatti by Ettore Bugatti in 1909. The defining technical element of the Epic X Chrono is the Jacob & Co. JCAA05 skeletonized self-winding chronograph movement. This high-end chronograph caliber is equipped with a column-wheel to launch the chronograph functions. Its counters are arranged in a bi-compax format, with the small running seconds on the left, at nine oâ€™clock, and the elapsed minutes counter on the right, at three oâ€™clock; the elapsed seconds are read on the central French Flag Red chronograph seconds hand. 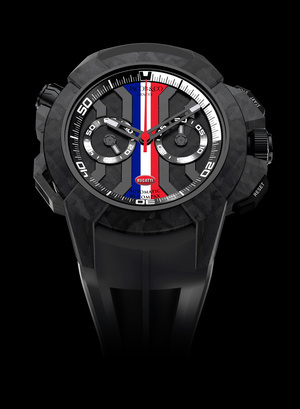 The Bugatti version features a newly invented special forged carbon case and incorporates the colors of the French flag into its bold dial design underlining Bugattis heritage. The timepiece comes on a special rubber strap inspired by the iconic rear bonnet of the Bugatti Chiron and will feature the iconic â€œEBâ€?? ?-logo on the buckle to commemorate the partnership.